Superstition Tuff – Occurs as a thin bed generally less than 50 feet thick, deposited over basalt and gossan breccias. Post mineralization. Only minor amounts of Superstition Tuff is located on the Molly Marie Prospect, because like the volcano that was once there, has been washed away by inland brine seas. Basalt – There are two layers of basalt and their thickness in total is about 130 feet thick. As described by Wilburn, there is a +/-1 meter bed of welded tuff between the layers of basalt, the Saddle Rock Tuff. At the Molly Marie Prospect this layer can be 5 to 6 feet thick. The lower portion of the basalt is named the Weekes Wash basalt(Fodor, S.K. Vetter) and is higher in silica than the upper basalt, The Cottonwood Spring basalt, and some trends to andesite. The Weekes Wash basalt appears to be thicker at the Molly Marie Prospect than at Goldfield. It is estimated it is 30 meters or 100 feet thick on the prospect. Whitetail Assemblage – Wilburn describes the Whitetail as lying unconformably on the granite up to a thickness of 500 feet. The upper Whitetail is approximately 250 feet thick, and contains more conglomerate than the lower Whitetail, varying from thin conglomerate beds in the sandstone to dense cobbles at the top. A large percentage of the cobbles are limestone and marble. Almost all Whitetail on the Prospect has been fractured and expanded into ridges of phreatic breccia. The lower portion of the Whitetail (approximately 250 feet thick) is nearly conglomerate-free. 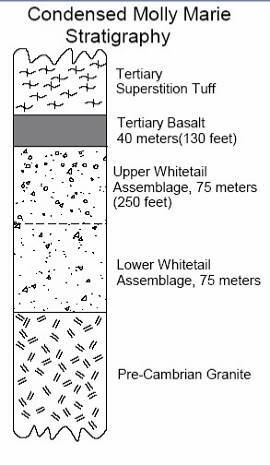 Snotnicki & Ferguson (Geologic Map of the Goldfield Quadrangle) label the lower portion of the Whitetail as Tertiary Sandstone(Ts). This arkosic sandstone is composed of fragments of eroded granite. Pre – Cambrian Granite – This is the basement rock and is called the Ruin granite. It varies in texture from a medium equi-granular granite to that of pegmatite granite with large phenocrysts of feldspar approximately 2 inches in width. 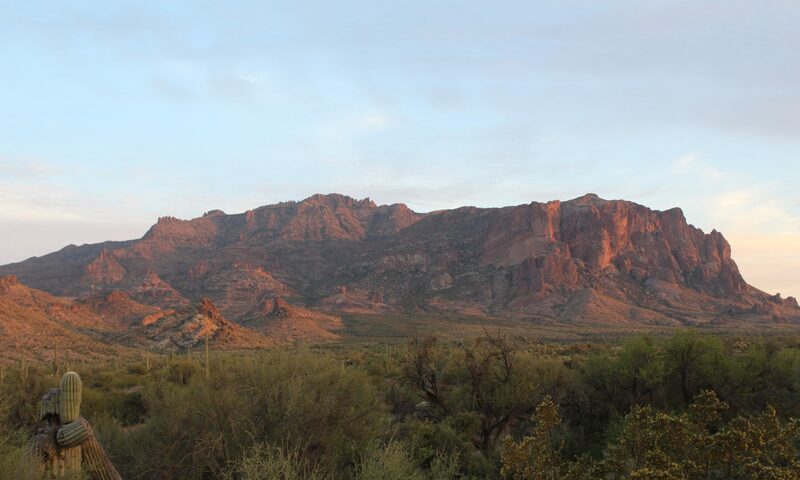 The arkosic breccias on the west side of the Molly Marie Caldera cut the granite, Whitetail assemblage, and basalt. Rhyolite dikes and the volcanic neck also cut the granite, Whitetail assemblage, and basalt. 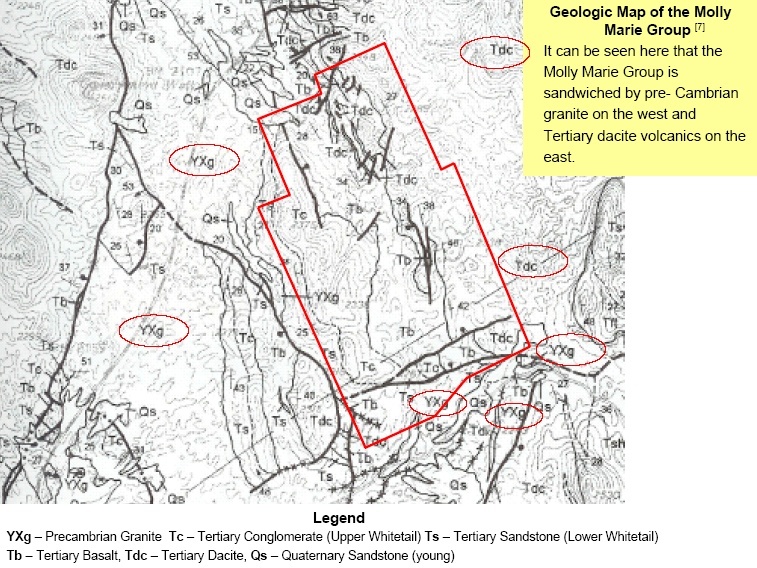 Below is a geologic map of the claim group. This is a portion of the Skotnicki, S.J. and Ferguson, C.A., 1995, Geologic map of the Goldfield Quadrangle and the northern part of the Superstition Mountains. SW Quadrangle, Maricopa and Pinal Counties, Arizona. Arizona Geological Survey Open File Report, OFR-95-09, 2 map sheets, map scale 1:24,000, . As shown on the pages within, the Rhyolite porphyry volcanic neck was not identified and mapped on the east side of the claim group. The area inside the claim group has dropped over 700 feet respective to the granite on the outside of the claim group.